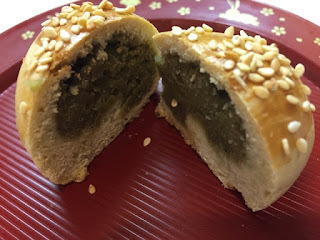 This is my second take on Japanese pastry - MANJU, while I enjoy the steamed version of MANJU, I tasted a very tasty baked KURI MANJU (MANJU with chestnuts and red bean paste) the other week. It was for Japanese food bazaar. It tasted so good. I want to try making it myself, except I don't have cooked chestnuts, so this is MATCHA Bean Paste MANJU. This is not a very good recipe that I tried. I got it from one of the YouTube blogger. But nevertheless, it's worth studying. Drain two cans of white kidney beans - Cannelini Beans - 15.5 oz or 435g - drained and rinsed. 1/2 C sugar in food processor, 1 Tbsp MATCHA powder, add strained beans. Over a low heat in a small pot, with a heat proof spatula, heat the bean paste until it can hold up on a spoon without spreading off. Basically heat over low heat to dehydrate the watery paste good enough to form into ball shape. With 1 inch cookie dough scoop or with hand, form the bean paste into a ball. Option is to buy Red Bean paste (AZUKI) from Asian market - heat over low heat to dehydrate enough to form into balls. Shift 3-1/2 oz Cake Flour Plus 1/2 C more for kneading with 1/2 tsp baking soda. Food Processor: 1 whole large egg, 1-1/2 Tbsp butter, soft; 1/2 tsp water; Add 3-1/2 oz shifted flour. Process till dough forms. Place in a plastic bag and refrigerate for 30 min. Take the dough out on a floured work surface and knead the rest of 1/2 C cake flour in. Roll into 1 inch rope. Slice into 8 to 10 pieces. Roll into balls. Cover and rest for 15 min. Take one dough and flatten between the palms of your hand into a disc. While the dough disc is still in the center or your palm, place filling in the middle. 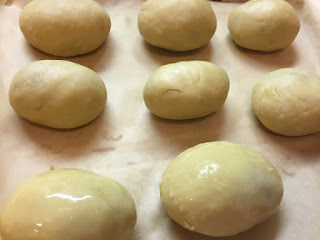 Cuddle the dough around the filling and start working the dough by slow push upward with the palm while hold down the filling with right fingers. 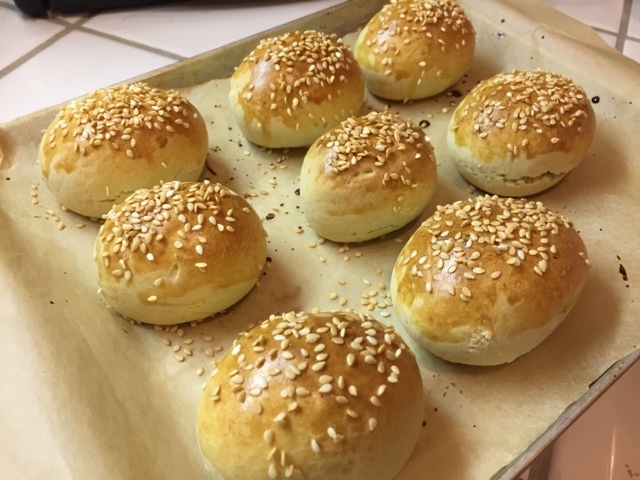 Slowly turn the dough while cuddling upward and pushing filling down until the opening closes. Place on top of baking sheet covered with parchment paper or silpat. Preheat oven to 325'F after making six. Prepare Egg Wash: 1 large beaten egg yolk mixed with 2 tsp of milk. 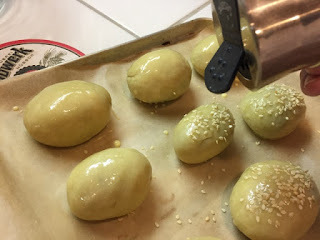 Apply egg wash.
Sprinkle with sesame seeds, if you have any. Bake at 325'F for 10 min*, then raise the temperature to 400'F and bake for 10 min* or just till the top browns beautifully. 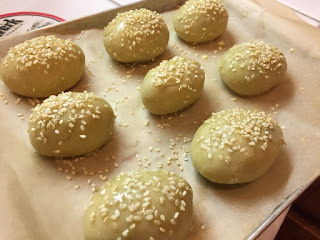 Be mindful of your oven's BTU power - Your MANJU might get browned beautifully after 15 min at 325'F. 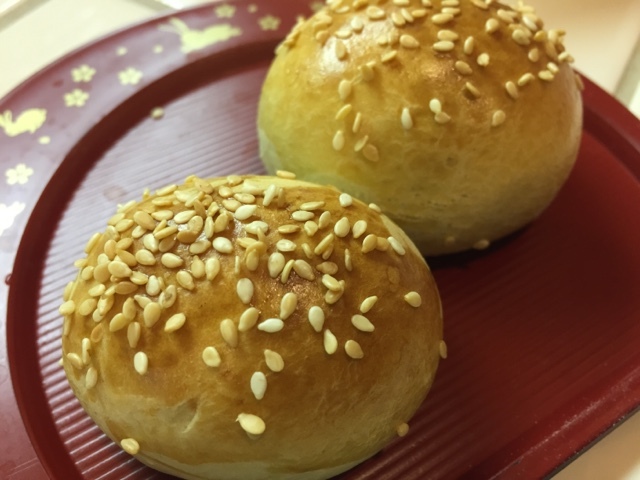 I think I like the steam MANJU better. And I think I need to study different dough formula.